Living in Japan, I tend to get overwhelmed by all the desserts sold in convenience stores, grocery stores or restaurants. I feel there’s an overwhelming amount of sweets sold and it can be hard to stick to my diet because there’s so much temptation everywhere. One of my favourite dessert has always been cheesecake but I haven’t eaten or made one in a few months! 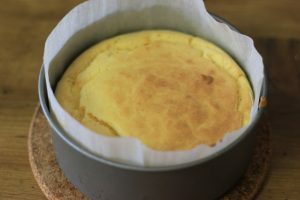 A few weeks ago, someone posted a video of a Japanese Cotton Cheesecake in a Keto group on Facebook and asked if anyone could ketofy the recipe. 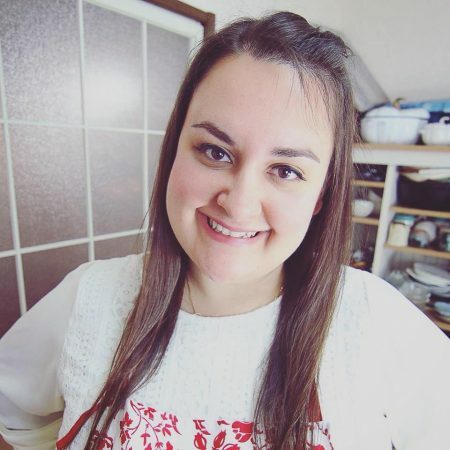 I decided to make one because I live in Japan and I looooove cheesecake so much, or to be honest, it was probably an excellent excuse for me to eat cheesecake! 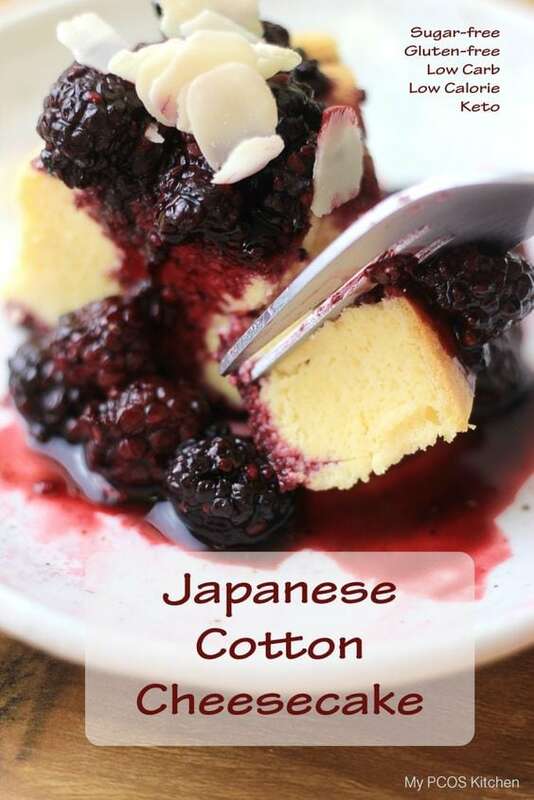 Japanese Cotton Cheesecakes are a bit different than normal cheesecakes as they are based on a meringue and are very light and fluffy. 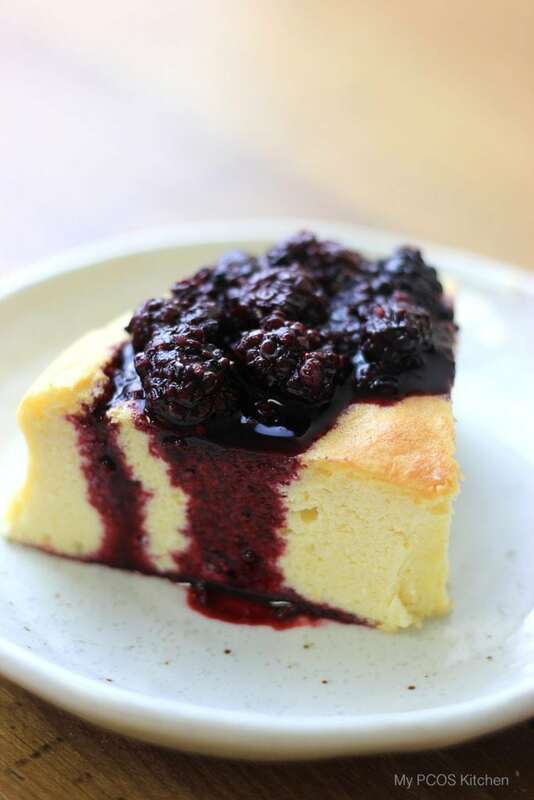 They don’t require as much sugar as regular cheesecakes and often contain flour. Some cheesecakes use chocolate instead of sugar and some can also add milk or sour cream. I chose to keep it simple and only used 5 ingredients: cream cheese, eggs, blanched almond flour, stevia powder and baking powder. I realize that when you start eating sugar-free, you tend to like things a bit less sweet than normal and so I didn’t need to add a lot of stevia because I found it was sweet enough. These cotton cheesecakes usually need to be baked in a water bath in order to prevent cracks as they do rise considerably high in the oven. When baking a cake in a water bath, remember to add aluminum foil around your cake pan as the water can go in! I didn’t do it the first time I made cheesecake years ago and the bottom got all soggy! Oops. I learned my lesson! This cheesecake can be eaten as is, or you can top it with whatever ingredient you have on hand. 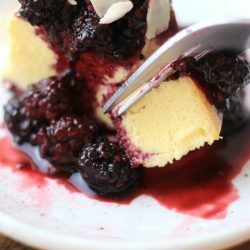 I used some frozen blackberries that I had and microwaved them for a minute and topped them over the cheesecake. 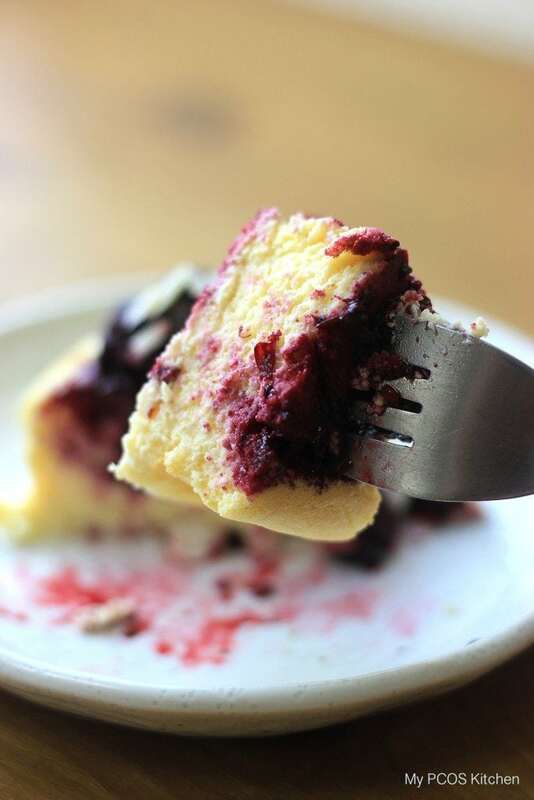 This cheesecake ends up extremely fluffy and pillowy so it’s extremely nice to the pallet! I like to add a bit of parchment paper around the cake so that it doesn’t stick to the mould and comes out easily! When it’s out of the oven, just let it cool down completely before cutting it! 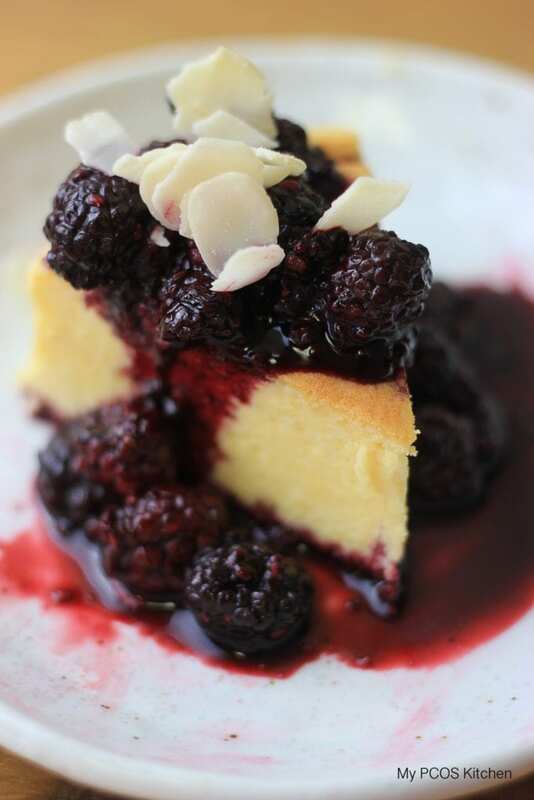 A yummy fluffy and spongy gluten free and sugar free cheesecake! Preheat the oven to 160C/320F. Add some water, about 2cm, to a baking tray and put it in the oven on the bottom rack.
. Wrap the outer bottom and sides of the pan with aluminum foil. Add the cream cheese to a microwave-safe bowl and microwave for 40 seconds or until soft. Separate the eggs, place the whites into a bowl and the yolks into the bowl with the cream cheese. , beat the egg whites for a minute and add 1/8 tsp of the stevia powder. Continue beating until stiff peaks form. Add 1/3 of of the meringue to the cream cheese mixture and carefully fold it in. When incorporated, add the next 1/3 and carefully fold it in again. Add the last 1/3 of the meringue and fold GENTLY. Pour the cheesecake mixture inside the springform pan and place it in the preheated oven in the water bath. Bake for 40 minutes, decrease the temperature to 140C/285F and bake for 10 more minutes. Take the cheesecake out of the oven and let cool completely. When cooled, cut into 4 slices. Top the cheesecake with the berries. If you double the recipe, use a 9" cake mold and just bake it an extra 10-20 minutes at 140C/285F. **While I know traditional cream cheese packs are 8oz, the packs in Japan are only 7oz so that's what I used for this recipe. I'm sure using an 8oz pack won't make a difference in the recipe, but if it does, try adding 5-10g of almond flour to the cake. I’m new at this and this looks amazing. I was wondering if the almond flour has to be blanched or it does not matter? since the almond flour I get it doesn’t say blanched or something like that. Hi Fernando, it just needs to be without the shell/skin. That’s what blanched means. White almond flour and not the brown kind. This was YUMMY! The only changes I made were: substituting xylitol instead of stevia and I added a vanilla bean. It is airy and light, nothing like regular cheesecake. It was delicious with a fruit topping, but it can be eaten plain paired with coffee or tea. Restraining myself from eating another piece 🙁 I will definitely make this again!!! This looks so good! Does it keep long? Hi Vanessa, it should keep for a week or so. If i want to uae erythritol what would be the quantity? 1/2 tsp stevia seems really less for a cheese cake. Am i missing something here? Stevia is 300 times sweeter than sugar, which is why in any recipe, you’ll never find more than a tsp. Try adding 1/2 cup to 1 cup of erythritol and see how sweet you like it. Hmm, I haven’t tried! Let me know if it works. 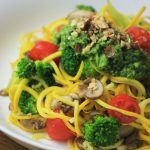 I am allergic to almond flour, can I replace it with coconut flour? If yes, what is the ratio? I haven’t tried, but maybe a couple of tbsp? It’s just to replace that “spongy” feeling the original version has. Could I replace the stevia with Monk Fruit and what would be the ratio? Yes and it should be the same amount as the stevia as they’re pretty much the same sweetness. Would it be possible to leave out the sugar altogether? Hi Khristy, of course. It just won’t be sweet that’s all. Oh, so happy find this recipe! 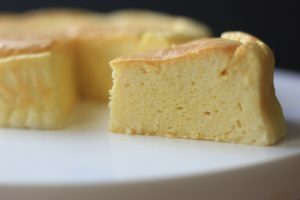 I used to bake Japanese cheese cake while I was living in Korea. One question, Can I use liquid stevia? I think you could, but you’d need to add a bit more and taste test the batter before baking! I only have a 9″ spring form pan. Would this be OK to use vs a 7″? I am not sure what the cook time adjustment would be. Yes, should be fine. You could even double the recipe. It should be around the same time. Thank you. I ended up just doubling the recipe since you had directions up there for that. You can never have too much cheesecake. In the video it looks like you are using 6 eggs– are you making a double batch?? Yes I was making a double batch! The calorie count doesn’t add up. It says 338 calories, but adding the protein, carbs, and fat only gives me about 115. Which is right? All that divided by 4 gives you 338 calories. 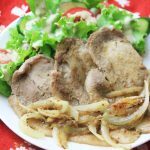 What is the sugar equivalent of the stevia powder in this recipe? I’d prefer to use a blend like Swerve. My research suggests it’s about 1/4 cup of sugar, but I’m not sure. I would use the confectioner’s and half in the egg whites and half in the almond flour. About 1/2 cup and add more if needed. can you add mango or banana in the recipe? I haven’t tried, but I’m sure you could. You may need to change the egg ratio or something. What’s is the carb content ?? Hi! There seemed to be a problem and I updated it! The carbs are 5.01g and net carbs are 3.41g. Hi Mira! 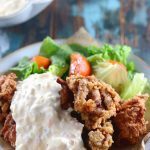 Can I replace almond flour with gluten free flour? Thanks! You should be able to!